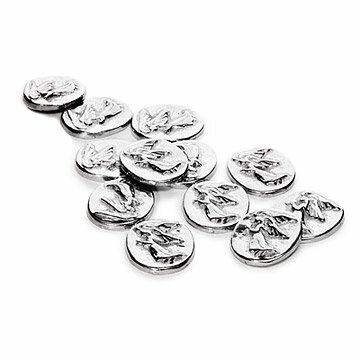 Bring the watchful eyes of angels to friends and family with these pewter angel coins. Bring the watchful eyes of the angels to friends and family with these beautiful pewter angel coins. Twelve coins come in a gift-ready pouch. Made in the USA. For years, angel coins have been thought to bring watchfulness from above. Legend has it that Napoleon lost an angel coin just before his defeat at the Battle of Waterloo. 1" L x 7/8" W; total weight: 2.75 oz. Love giving these for inspiration. I love these angel coins, I give them to my family members and even place them in the pockets of our family that has passed. Our kid has several teachers, so we were looking for a thoughtful gift that was affordable and that could express how special they are to all of us. These were great, I put these in a small velvet bag with a note thanking them for watching over our child. An angel to carry in your pocket! I keep one in my pocket where it serves as a reminder to remain grounded and thankful.